Get the best out of your records. Great vinyl playback isn't always easy to get right. Record players are very much like fine musical instruments, and to get them sounding at their best, your vinyl rig really needs an audiophile-grade phono stage preamp. To disperse the mystery surrounding these highly-specialized pieces of audio gear, we decided to pick the top current examples on the market and go in-depth into what makes a great phono stage, along with what to look for when buying one (in our Buying Advice section below our picks). Phono stages can be tricky, but they’re also essential. After reading our guide, you’ll know everything there is to know. For more background information on phono preamps, see our comparison table and buying advice below the picks. What We Like: Dual-channel design, hugely adjustable, tons of features. What We Don't: No balanced out option. VP Industries, also known as VPI, are a huge name in reference vinyl playback. In 2018, they released the Voyager phono preamp designed by Mike Bettinger. The Voyager is a more affordable version of Mike's legendary Arion design, still delivering a mastering-grade reference playback level of performance. Essentially a dual-channel design, each of Voyager's channels is capable of amplifying either Moving Coil (MC) or Moving Magnet (MM) cartridge signals - please refer to our Cartridge Type explainer below for more information on these. Capacitance and load options are user-definable and offer an incredible amount of versatility, even when faced with obscure or low-output cartridge types. The JFET-based input stage design gives the Voyager much of its sonic character, though it's impressive that the second stage of the circuit kicks in an additional 24dB active boost for the tracking of the low frequency portion of signal. This delivers a substantial difference to the bass - although broadly speaking, the Voyager's tonality follows the well-established RIAA frequency response. We have an extensive explainer on RIAA and other classic equalisation curves in our Buying Advice section below. Designed as a symmetrical single-ended circuit means that the Voyager is the purest-of-heart in terms of phono preamp engineering. Sadly, this also means that there's no balanced output option here, which is our only real complaint. However, for the money, phono preamps don't come better than this. The VPI Voyager represents the ultimate balance of quality vs. investment. Cartridge Capacitance Range: 150, 220, 330 pF. What We Like: Design, audio quality and user control over impedance and capacitance. What We Don't: No XLR outs. SPL is one of the most recognizable names in the audio industry, and they single-handedly revolutionised transient processing (think punch) with their Transient Designer line. We mention that since, for vinyl audio in particular, transient detail is king. A brief glance at the ProFi front shows the two most desired audiophile phono stage requirements - user definable control over input capacitance and impedance (both explained in our Buying Advice below). This, plus the fact that the ProFi can accept signals from both MM and MC type cartridges guarantees that this impressively specced phono stage can handle any vinyl era. Despite not featuring balanced outputs, there are three user-definable settings for line output gain, including the -10dB and the pro-level +4dB options. The main reason for the ProFi’s incredible gain readings and audio fidelity is SPL’s VOLTAiR technology, employing an unusually high voltage, which brings the benefits of an increased dynamic range. The Phonos ProFi is more pricy than the Pro-Ject RS, at number five on this list, which offers similar impedance/capacitance control. Although this model features fewer settings, SPL have really managed to nail the most useful settings and still win in terms of sonics. This phono stage can become the beating heart of a super-versatile vinyl setup, dragging those vintage records screaming right into the 21st century. What We Like: Looks great, sounds expensive. What We Don't: Out-of-this-world price tag. WIth the ability to make cheap hi-fi gear look like a million dollars, it takes only a glimpse to recognize that the Luxman EQ-500 phono amp is in a league of its own. The ultra-clean design, choice of materials, fonts, and even knobs speak volumes (pun intended). Going past those first impressions and taking a peak at the inside specs, our suspicions are confirmed. Almost every single component of Luxman design is unique - from the custom-made Moving Coil step-up transformers to the specially commissioned JJ Custom tubes. We don't have enough space to name the numerous high-end parts found under the hood, so let's just say that the Luxman is ready for virtually any vinyl cartridge on planet Earth. Why the name EQ-500, you might ask? While Luxman themselves refer to the EQ-500 as a phono equaliser amplifier, it's important to understand that any equalisation (or frequency filtering to be precise), is applied passively via the actual circuit components. This is unlike active equalisation, which is often far too crude for the delicate signals of a Moving Coil cartridge. Luxman take pride in their 50-plus years of experience in designing such circuits and have been captivating vinyl enthusiasts ever since their groundbreaking E-06 preamp. Standing on the shoulders of such a giant, the EQ-500 delivers an eerily good performance. Every phono amp should sound like this - we only wish it were possible for a lower price. What We Don't: Stereo imaging seems a bit unbalanced. At some point, the majority of us have come across the ART Pro Audio brand. Their "Applied Research and Technology" has survived many a decade by doing exactly that - creating low cost, but perfectly capable solutions for musicians and music lovers. 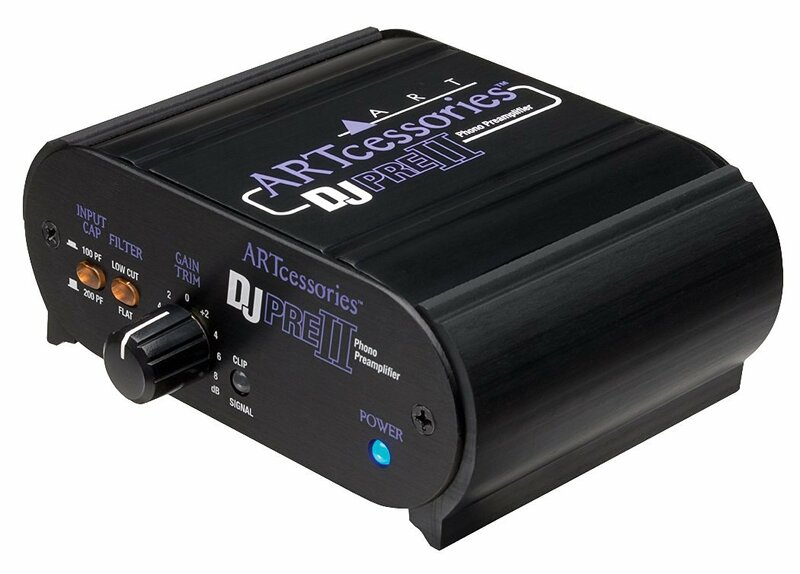 The DJPREII phono stage is housed in ART's trademark, heavy-duty chassis allowing for multiple units (or various other models) to be stacked on top of each other. Its shape, buttons, LEDs and even graphics are all designed with good taste. The front of the unit features the unit's gain trim knob, with a dedicated signal/peak LED. You will also find two buttons dedicated to capacitance (switchable between 100pF and 200pF) as well as rumble filter on/off. Powered by an external power unit (DC or AC), the DJPREII feels reassuringly simple, yet sturdy and solid to the touch. If you're new to phono stage preamps, it would be easy to have doubts about the ability of anything so inexpensive to offer any noticeable improvements to vinyl playback. We actually found this little ART box punching well above its weight - it delivered a very clear sonic picture with a substantial weight, authority, and a pleasant mellow character. It takes a little time to dial this fella - especially with the Gain knob potentially sending signals into the clipping zone - but once set, the DJPREII is worth every penny. What We Like: This is crazy - it can take levels from MC/MM carts and even Line sources. Incredible A/D conversion spec - even managing native DXD/DSD recordings! 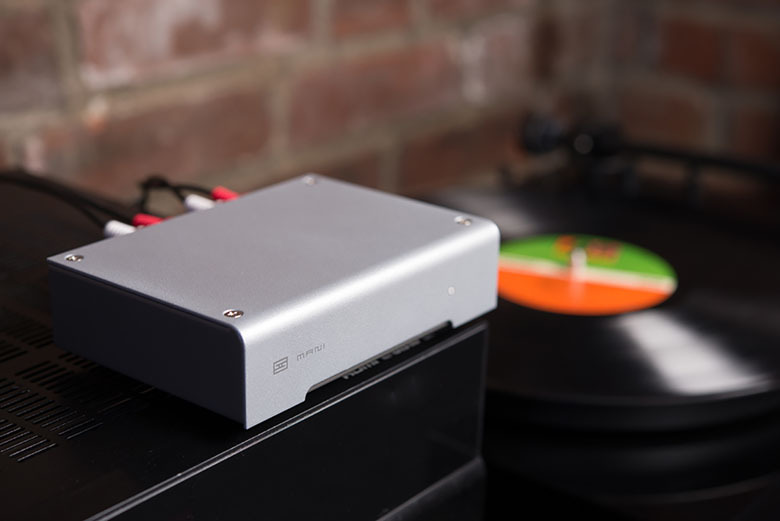 M2Tech's EVO is a phono stage with a twist. A serious one at that, The name phonoDAC probably reveals the reason for that - OK, maybe half of it. Indeed, M2Tech have built a phono stage box aimed at vinyl purists seeking to convert their precious vintage records into digital audio. Don’t start yawning yet: we know phono-to-USB boxes have been around for ages, and are ten-for-a-penny now. The EVO takes their game to a new level. Not only it can accommodate signals from both high and low output record cartridges, but can even handle input gain and impedance levels from line level sources and then acting as a super-high quality DAC (digital to analog converter) digitize vinyl to the highest current audio file formats - namely, 32bit/384kHz PCM and even native DSD formats. If these figures don’t mean much, it’s worth noting that vinyl playback (being analog) has a very wide frequency range. Being able to capture it in digital in such high resolution qualities, guarantees that all of its sonic glory is preserved. This incredible phono stage / DAC offers up to twenty six user-selectable EQ curves - perfect for those slightly scratched old vinyl records. This phono stage can do what most phono boxes do on a good day. Admittedly it may be not be for everybody, though if you are planning to digitise your vinyl library in super hi-res quality, this really deserves your attention. Cartridge Capacitance Range: Set at 120 pF. What We Like: Great looks, and we do like the sound of those tubes. What We Don't: Tube designs are a bit of an acquired taste. Expensive. The Marchand LN112 MC is a glorious-looking phono pre that proudly displays its real wood casing graced by four glowing Sovtek 12AX7WA preamp tubes - the very type used in high-end instrument amplification. It isn’t easy to come up with a tube-driven phono stage circuit that can handle LOMC (Low Output Moving Cartridges) and still remain relatively noise-free, when compared to a solid-state design such as the SPL ProFi. Marchand have managed to pull this challenge off by using Jensen MC transformers, supplying an additional 20dB of gain to the RIAA-specced circuit (we explain what this means in the Buying Advice below) . Although the input impedance and capacitance figures are fixed, Marchand are more than happy to tweak things to request - just specify your rig requirements when ordering. This perhaps is not as flexible as having dials as in the above example, but again, this is a handmade tube stage box which is priced very competitively. If you prefer more contemporary high output MM record cartridge, a suitable alternative model (the LN112 MM) is available. The L112 MC pho stage box really shines with its increased dynamic performance - the glowing tubes are not just there to look pretty. What We Like: Fully-balanced performance, superlative sonics. What We Don't: An external PSU could have improved noise figures further. We've featured Musical Fidelity in several other shootouts, and with their M6 phono stage, we definitely believe they deserve a place here. Its substantial size (think a regular hi-fi component), is justified by the fact that the M6 is a three channel affair. This not only means that you could have three turntables connected at once, but also allows for the channels to be set for three different cartridges, or even tone arms. There are plenty of people out there who use their vinyl rigs in a similar way. Of course, all of this is helped by the fact that the M6 accepts both MM and MC carts. Each channel can have a different and completely discrete load and setting. Even better, they can have a separate dedicated PSU and even a separate transformer for each side of the signal. Setup is really straight forward - options are clear and self explanatory, basically employing several mini buttons to scroll through functions. It is nice that the Power/Standby button also has a Mute option. This really helps if you need to make a cartridge change without having to power down your complete rig in the process. The MM/MC cartridge type selection also includes load options for MM and MC carts. The IRC (rumble on/off) option works as expected, but it's neat to also find a Gain boost option - adding a whopping 6 db to the signal. Each channel remembers its last configuration. So, it's easy to set up for a particular record player or cartridge - set and forget, at least until you need to change the slot/channel settings. The M6 is fully balanced, with both sets of outputs (RCA and XLR) being simultaneously active. Though this offers additional flexibility, we recommend using balanced connections when possible. The Musical Fidelity is a mothership of a phono stage, with a truly unique design and a beautifully grown-up sonic signature. Cartridge Capacitance Range: 100, 200, 300, 420, or 520pF. What We Like: Infinitely adjustable impedance, XLRs, looks and sound. What We Don't: The price tag. If you’re new to the vinyl niche of the A/V market, you might find the Phono Box RS’s $1K price tag as ridiculous. Then again, this is another example of the crème de la crème. Pro-Ject is a brand well known for their products among vinyl connoisseurs, and the Phono Box RS is a firm favorite among listeners. Starting with the Pro-Ject RS front, you might easily mistake that big rotary knob as the volume; it is in fact an ‘infinite’ gradual impedance pot, which allows you to fine-tune the input stage impedance during playback - a tremendously useful feature allowing you to use any cartridge (please check our Buying Advice section for more on this, which has an extensive explainer on impedance matching). Pretty much every other important signal parameter is featured in the clever set of mini switches located on the front right hand side - from selecting balanced/unbalanced outputs to applying classic EQ curves to the frequency response. When used with moving coil cartridges, matching the capacitance (another big feature, again explained in Buying Advice) to a particular cartridge model is easily done with a further set of mini switches at the back. The unit features a built-in audiophile rumble filter, and all of the audiophile-grade components inside are powered by an external, high capacity power supply. Can you hear a thousand dollar difference? Yes you will - the Phono Box RS has bags of clarity with ultra low distortion figures and superb signal-to-noise ratio. What We Like: Great MC cartridge audio quality, some nice upgrade options. What We Don't: More capacitance loading options would have been nice. The Soundsmith MCP2 MKII is often called ‘revolutionary’ by its designers - by that, of course, they mean its price. Serious vinyl setups can have sky-high prices, and for many audiophiles this box probably still qualifies as a budget solution. What it can offer though, is a genuinely impressive audio performance and low noise figures - especially considering that it’s designed for moving coil cartridge setups only. These are notoriously difficult to optimize in terms of signal gain, and their extremely low signals can be often marred by long cabling and power supply. Luckily, the MCP2 MKII features a newly upgraded external power supply that is virtually silent. 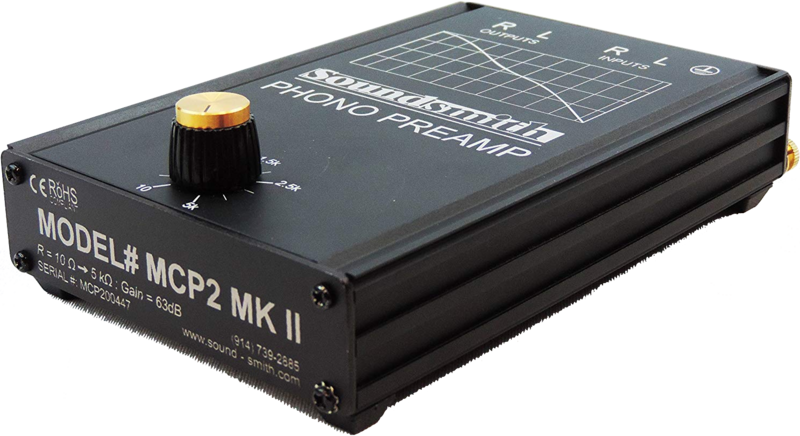 The good people at Soundsmith offer an optional upgrade for the MCP2 MKII that changes the output impedance to 50Ω. This might be just the thing you need if a particular install necessitates a turntable positioned quite far from the preamp. The issue with long signal cables can be a real problem for moving coil cartridges as they affect the capacitance of the load, which in turn can rob you of precious treble frequency content. The 50Ω output optional upgrade compensates for that loss - it might well be worth the $300 asking price, if that’s what you need. In terms of general audio quality, we wouldn’t hesitate to describe the Soundsmith MCP MKII as sublime. It’s a truly stellar piece of gear deserving of your attention and budget - if you can afford the steep price tag, of course. What We Like: Adjustable, plenty of features. What We Don't: 12V DC Power Supply is not included. 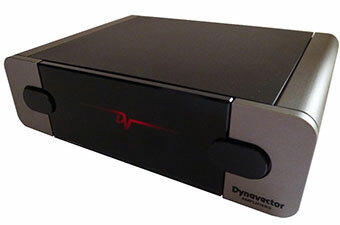 Dynavector Amplifiers from Australia promise that their P75 Mk4 offers 'a far superior rejection of common-mode noise' than any other phono amplifier. Despite sounding like a bold statement, especially in the company of the high-class phono stages on this list, we like strong convictions. The P75 Mk4 is a fabulously spec'd device, which is extremely quiet and versatile. This phono stage can be matched to virtually any cartridge on the market - done easily by several user-definable internal jumper blocks settings. These internal mini-switches can be adjusted to suit low, medium, and high output cart signals with a wide selection of impedance and capacitance options. One of the features that make the Dynavector somewhat unique is their patented 'Phono Enhancer' option, which is particularly useful for low-output Moving Coil cartridges. To avoid using heavy technical jargon, we describe this function as a 'fine-tuning' of the impedance loading. This is easily done, even if you are new to this sort of thing - just follow the manual's recommended setting for your specific cartridge. The sonic performance is close to spectacular, even when compared to the majority of devices in this price range. However, there is one major aspect missing - slightly mind-boggling even. The P75 Mk4 does not come with a power supply. Yes, it is only a regular 12DC 500mA current required to power the unit, but we strongly believe that a matched PSU should be included - especially for the price! This oversight definitely knocks the P75 Mk 4 down a couple notches, in our opinion. We love Hafler - for over 50 years they have produced some seriously good hi-fi gear and the PH60 is one of them. It is deceptively simple in appearance, and the fact that this is a Class A transformer-less device may not be apparent at first glance. Even more interesting is that this is a dedicated moving coil phono stage. Hafler are clearly aiming this product at audiophile vinyl collectors, preferring the sound of the notoriously difficult to amplify MC type of cartridge. We talk about the pros and cons of cartridge types in our Buying Advice below our picks, but it has to be said that moving coils and noise normally go hand in hand - simply on account of their extremely low output. This is exactly the challenge that PH60 handles without even breaking a sweat. This phono preamp’s most impressive feature is its ultra-low noise floor figures, as it manages to lift those whisper-quiet MC cartridge signals to a full-bodied line level, and with zero noise. The high current external PSU eliminates mains pollution noise and the case, as well as the internal circuit topography, also reduce potential RF interference. The only button visibly present is the low cut rumble switch, though you have further customizable options which can be accessed by unscrewing the top of the unit. These are impedance loading mini-switches which accommodate 99% of MC cartridge readings. Still: Hafler have not let the remaining potential 1% of esoteric load figures spoil your fun, leaving an empty resistor slot. Upon contacting their service department and providing them with your cartridge specs, they can provide you a with a suitable resistor to meet your needs. We have seen the PH60's availability fluctuate on Amazon - so be sure to check back often, and pick one up if it comes available. What We Like: Incredible value for money. What We Don't: The signal-to-noise performance is not as good as the JoLida JD9 II. The Pro-ject Tube Box DS offers a big improvement over the Austrian company’s already great-sounding, solid-state Phono Box DS. Designed by Dr. Sykora, the Tube Box DS borrows quite a few features from its more expensive sibling - the flagship Phono Box RS (number 5 on this list). For starters, you will see the same variable impedance dial on the front. You can, in fact, optimise the load of any MC cartridge while playing a record, and that impedance covers anything between 10 - 1000Ω. Where these two phono stages differ - understandably due to the different budget tiers -, is in their user definable capacitance settings. The Tube Box DS has only two options (100/200 pF). It needs to be said that, although we feature several tube phono stage preamps on this list which work with both moving magnet and moving coil cartridges, this is far from normal. As we mentioned before, generally speaking, tube designs struggle with low output MC carts. The Tube Box DS, which features two EC83/12AX7 tubes, thankfully has the ability to handle both types via the mini switches at the back. Its extensive impedance and capacitance loading options represent one of the best tube designs in terms of value. The high voltage (18V) external PSU guarantees good signal-to-noise performance, and the super-accurate RIAA frequency curve offers a familiar classic sonic signature. Despite all of this sonic goodness, when put to the test of high level playback (above three quarters of the volume knob) the Tube Box DS is less transparent than the Phono Box RS, or even the Hafler at number 10. But, to be fair, they are considerably more expensive. This is another elusive pick that you might have to do some digging for. But, if you can find it, you're in for a treat. Famed for some of the most legendary turntable designs since the 1960’s, Thorens have continued to develop their specialized range of exclusive vinyl-playback related products. The MM-08 ADC is their fresh take on the now established concept of an audiophile-grade phono preamp doubling as a USB interface. ADC in the title stands exactly for that - an analog-to-digital interface, capable of digitizing analog audio to a very high definition bitrate (24Bit/96kHz). Even if the the fact that the MM-08’s primary function might be dedicated to analog vinyl playback, the inclusion of a super-grade ADC chip (the 24Bit Tenor TE7022L Delta Sigma) guarantees that the subtle detail is captured in high definition. To do so, you would need an audio editing software, but it is that chip alone that makes the quality of the transfer so much better than cheaper options. If you need an even better quality, the M2Tech at number five will do that - although for a much higher expense. Designed with extreme attention to detail, the MM-08 analog playback is quite close to sublime. It displays a bold, near three dimensional soundstage with tons of transient detail. As with so many phono preamps, it is recommended to leave the unit to ‘come to its senses’ - you will notice a minute but definite increase after a day or so - mainly in the attack of the notes. Its performance with both MM and MC cartridges is very much on a par with the Pro-Ject above at number 11, and although they both have very similar impedance load options, Thorens have not left user-selectable capacitance load options. Still, if you are after a phono stage for around $400, this is an amazing option. What We Like: Great sound, headphone amp included. What We Don't: The headphone amp included might not be needed. Being the slightly more muscular version of the brilliant Cambridge Audio Solo, the Duo ups proceedings by adding a very capable headphone amp and the ability to accept moving coil cartridge signals. Let’s start with the headphone amplifier - in our opinion this may somewhat limit the Duo’s universal appeal, as not everyone looking for a good phono preamp needs a phone amplifier. Audio enthusiasts love a good bang-for-buck and it’s clear that a ‘pure’ phono stage costing the same would offer something more in terms of audio benefits. At the same time, if you’re not using a receiver but a power amp or even a pair of active speakers (without a headphone option), the Cambridge Audio Duo becomes the absolute perfect missing link. We really like the sound of the included amp, so let’s hope that Cambridge Audio have done their market research first. In regards to vinyl playback, the Duo is really one of the best-sounding phono stages for its price tag. Its sonic character leaves an impression on account of its silky top frequency portrayal - nothing missing in the top end and yet never shrill. The low end punch is equally impressive and the overall performance would certainly challenge the Thorens at number 12 above. We mentioned moving coil carts - yes, the duo can handle pretty much anything in terms of cartridge signal loads. Despite the fact that it does not have user-definable load options like more expensive units, it’s so well designed that it might ‘struggle’ with only the most obscure vintage low output moving coil cartridges. What We Like: Good detail, nice headphone amp, and you can upgrade the stock tubes. What We Don't: Power supply might need an upgrade. The Bellari VP130 is a tube driven phono stage preamp which also features a built-in headphone preamp. You may find some Bellari units carrying the Music Hall brand name - Bellari is in fact a division of the Rolls Corporation. What is commendable here is the fact that they are manufactured in the U.S., despite their relatively cheap price tag. It is inevitable that being competitively priced may result in some compromises in the spec department, but thankfully in the case of this phono preamp, they are minor and easily upgradable. The first thing that comes to mind is the 12AX7 preamp tube, which can be easily swapped for a far superior sounding unit. This practice, widely known as tube rolling is arguably the biggest upgrade as far as sonics are concerned - often the equivalent of fog being lifted, revealing previously unheard details. The second point in regards to upgrades needs to be made strongly - the Bellari VP130 can really benefit from a power supply upgrade. The included 12-15V unit is, frankly speaking, unreliable and quite prone to electrical hum pollution. Again, for a relatively low price, a well-specced PSU can do wonders, resulting in virtually noiseless performance from the Bellari. Which in its own terms is a hugely capable device with bags of detail and weight behind the transient hits of any audio passing through it. 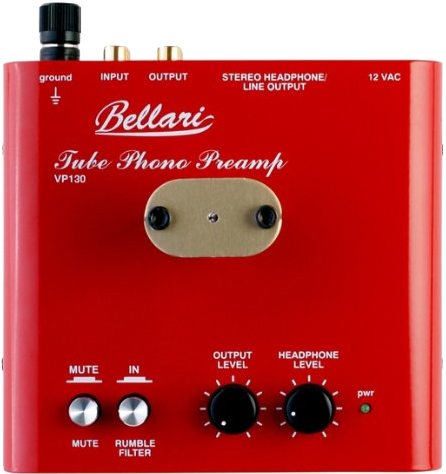 We like the fact that Belarri have included a very decent headphone preamp too. Featuring a quarter inch jack and a separate headphone output level control confirms the claim that the VP130 is aimed at price conscious vinyl connoisseurs. Already a formidable unit, it can really deliver well above its price, especially if you are ready to try our mod recommendations. What We Like: Famed Schiit build quality and sonic performance. What We Don't: No complaints for the price. Schiit’s reputation is pretty much second to none - we’ve reviewed many of their highly desirable audio toys, from headphone amps to DACs, and if you’re unfamiliar with their line of products (all made in the U.S.) just check their current catalog. The Mani is their take on a specialised phono stage preamp, and it is equally at home with classic moving coils or with high output magnets as far as cartridge signals go. The input impedance that Mani can take is automatically adjusted from 47 Ohm (typical for MC carts) to 47 kOhms (MM carts) and the Mani also allows four user definable input gain settings for boosting those ultra-low moving coil signals. Just like many phono stages, Schiit have deployed the RIAA classic curve tonality and all that of course is achieved with passive equalisation. High voltage PSU keeps mains pollution noise at bay, and the sonic precision of this preamp belies its fairly modest price. What We Like: Healthy output, good sonics and build quality. Additional 3.5mm output. What We Don't: It still remains a fairly basic package by not supporting MC carts. There are quite a few inexpensive phono preamps on the market - most of them performing well - and yet the main difference lies in their subjectively perceived output level. 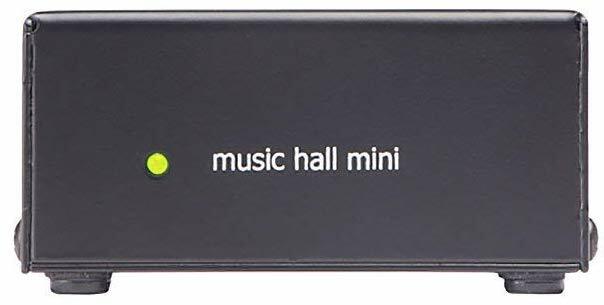 The Music Hall Mini might be, as the name suggests, very small and stripped down in terms of features, but it has a healthy output. Where this becomes especially important is in setups involving several audio sources - the Mini’s line out feed can easily match that of a CD player. This makes source selection seamless, and it takes away the stress of having to ride the volume knob on your receiver. Music Hall have been around forever and you recognize their expertise immediately by the Mini’s sonic character - large, proud and detailed. It faithfully reproduces the industry standard RIAA frequency response and it can accommodate moving magnet cartridges, as well as some high output moving coil models - check our explainer on Cartridge Types in our Buying Advice section, below. Its output - lifted to a Line level - is interestingly split to two pair of outs: the regular RCA and a 3.5mm minijack. This opens up a number of possibilities - one being that the Mini’s second output can feed a high quality headphone amp, for instance. We like the build quality: it feels sturdy and we’re pleased that Music Hall make them in the U.S. while managing to be competitively priced. What We Like: Improved bass content for 78rpm record playback. What We Don't: No on/off switch. Thechnolink TC-778 proves a great budget choice for anyone with a vinyl collection comprising of different RPM speeds. The strong selling point of this phono stage is its extremely faithful reproduction of the classic RIAA equalization curve, as well the option of a second frequency response mode, which caters to improve bass response when playing 78rpm records. If unfamiliar with what RIAA and passive equalization stand for, please check our Buying Advice explainer below our picks. Designed for moving magnet cartridges, the TC-778 can accommodate signals from some high-output MC (moving coil) cartridges too. What we were most impressed about was the low noise performance figures, especially considering the price. The TC-778 delivers a ballsy and impactful audio performance without the usual hums and buzzes normally associated with some budget phono preamps. We would have preferred to see a on/off switch and possibly even a gain knob, but as it is, the TC-778 is a savvy piece of a phono preamp that would challenge anything with a higher price tag. Here's a staggering statistic for you: Pro-Ject have officially sold half a million Phono Box preamps. To celebrate, the company will shortly be releasing a new version, the Phono Box S2 Ultra, as well as a limited-edition Ultra 500 model. This model comes in a wooden display box and boasts a chrome chassis that looks supreme. We are also very keen to try the newly released VTL TP6.5 Signature phono preamplifier, announced at CES this year. This stage is a beast with a price expected to be around $4.500. Violectric have a new toy on the way, too - the PPA V600 - which looks promising. For roughly $1,600, it's expected to be a very versatile phono amp. Lastly, the uber DAC specialists, Chord, are offering a brand new flagship Moving Coil phono stage. The Chord Symphonic sports selectable gain, impedance and capacitance options, and its specs are off the chart. Phono stage preamplifiers are standalone analog devices which boost the electromagnetic signals received by the record player’s cartridge to a line level output signal, as necessary for reaching a power amplifier’s input stage. Phono stage preamps require their circuitry to be highly versatile, as they are often tasked with amplifying ultra-low signal levels delivered by cartridges of different design type (MM/MC, which we’ll explain below). These cartridges in turn deliver vastly varying signal gain and impedance results. High-end phono stage units offer extensive control over parameters such as capacitance, impedance and gain, which can prove especially beneficial in setups dealing with large music catalogs covering different eras, vinyl specifications and requiring different cartridges. The more control you have, the better things will sound! It is important to remember not to connect the output of a turntable with a built-in phono preamp (i.e. newer generation record players featuring line outs) to the input of an external phono stage. Similarly the output of a phono stage preamp is raised to a line level, so when connecting it to the next device in your system chain (i.e. A/V receiver, hi-fi preamp or amplification) the type of input it’s connected to must be line level as well - normally labelled either as Aux or Line In just don’t connect it to the Phono In of your A/V receiver! Once a vinyl ‘rig’ is fine-tuned, simply no CD or any other digital media playback can even come close, on account of audio depth, width, warmth, punch, transient detail and just the sheer musicality emanating from vinyl records. Vinyl enthusiasts trying to improve their audio first reach out for a real good cartridge - the easiest ‘mod’ which delivers an immediate and often tremendous difference in sound quality. Getting the silent-as-a-whisper signal of the cartridge optimized to a healthy level needed by an amp’s input stage is one of the biggest challenges for achieving that coveted sublime vinyl playback. and this is why you need a great phono stage. When choosing our picks, we’ve looked at phono preamplifiers capable of pairing with a wide variety of cartridges. We also namecheck circuit components and features affecting the all-important signal load, dynamic range and even the voltage currents used by the units’ power supplies - all of these are crucial factors for a great signal-to-noise ratio and correct frequency response. What may come as a shock to you are some of the price tags. While we do start at the top of market where prices are eye-wateringly high, we descend through all price tiers, and even the cheapest examples on this list (around $60) deliver a real and noticeable improvement to vinyl playback. As with any A/V related technology, there’s always something else out there that does it better. It is a fact that your regular A/V receiver or hifi preamp probably has a phono input, which means that there is an integrated phono stage present already. It is super rare that these are any good though - they surely will do the job in most cases, but they will sound generic. This of course won’t be evident until you’ve compared them to something really good. The SPL Phonos ProFi MM/MC, for example, will sound leagues away from a stock phono input. As explained already, in the instances of putting together a proper vinyl setup, getting a dedicated phono stage with control over the cartridge signal impedance, capacitance and gain is as vital to record playback quality as the choice of your cartridge. To deal with the challenge of boosting ultra-low signals, phono preamps often feature advanced features, such as isolated dual-mono inputs (meaning each side of the stereo feed has its own dedicated discreet circuit), input stages with variable impedance and capacitance (via pots or switches), balanced connections and even switchable passive EQ modes (explained below). Many high-end models feature truly esoteric circuit components (precision film capacitors and resistors, and low-noise Class A gain stages) which translate into staggeringly high price-tags, but the sonic results can be often astonishing - with super-low noise/distortion floor, increased resolution and transient response with super natural, life-like portrayal of any frequency spectrum. We’ve already mentioned that record cartridges are broadly divided by two types - moving magnet (MM) and moving coil (MC). Choosing one over the other often depends on your taste and record collection, as each type has its own sound (as well as its pros and cons) and each is arguably suited for specific purposes. To outline their differences, let’s start with the stylus (needle) first. When tracking the record groove, the stylus moves vertically as well as horizontally, and these movements are picked and converted to electromagnetic signals and sent through the wire in the tone arm directly to the phono stage preamp. This audio signal has an ultra-low level and is generated by a magnet and/or a coil - not unlike a very primitive microphone. Every phono cartridge features both a magnet and a coil, but they can have a different placement and function in regards to the stylus and this is where cartridge types differ. Moving Magnet (MM) cartridges are the most common type and are hugely popular with ‘ordinary’ vinyl setups - their high output is well suited to the phono stage preamps found in traditional hi-fi preamps and AV processors. They feature two magnets (one for each stereo channel) at the end of the stylus. If their high output is the big plus, the weight of the magnets is the disadvantage, as it reduces the ‘agility’ of the stylus - tracking is therefore a bit less precise, which of course affects transient detail. Moving Coil cartridges (MC) are pretty much the reverse of MM carts - instead of two magnets they feature two coils. These smaller and lighter components result in a much more accurate tracking and greater punch detail (transient attack). Unfortunately, moving coils generate a smaller electromagnetic current than magnets, and that’s a huge disadvantage when compared to MM cartridges. Despite their great sonic detail, the output delivered by MC type carts is so low that they are often unusable with generic hifi phono preamps. This is where a dedicated phono stage preamp well-equipped for MC signals is most needed and this combo (MC cartridge and phono stage) is arguably the first serious step towards an audiophile-grade vinyl setup. Unlike MM cartridges which generally feature replaceable styli, MC carts feature integrated needles, which cannot be replaced - when damaged or worn out you’d need to purchase a new one. While most phono preamps offer both MM and MC functionality, it's not uncommon for a high-end piece of gear (like the Marchand LN112 MC) to be MC only - as you can probably tell from the name. You may also come across an MI cartridge, which stands for moving iron, this is a variation of the moving magnet type at present, although some vinyl specialist insist that it deserves it own category. Speaking of variations, another one exists - HOMC, which stands for high output moving coil - self explanatory, really. But honestly: MM and MC are the ones you will more likely than not have to worry about. Cartridge impedances vary from model to model, and to get the best possible audio quality, these values also need to be matched in a specific way at the phono preamp inputs. The vinyl gospel for impedance matching of MC cartridges (the most problematic, due to their extremely low output) is that the impedance value setting of the preamp needs to be roughly 2.5 times higher than the cartridge impedance value. If, for example, you happen to be using a classic Denon DL103 MC cartridge which has an impedance value of 40 Ohms, the close-to-ideal preamp impedance setting would have to be 100 Ohms. In order to dial in such minute but important settings, audiophiles of the past decades have had to use additional ‘step up’ impedance transformers - just so that the phono stage preamp can receive the correct load, before in turn boosting it to line level. SUPs (step up transformers) are still around, but many of the finest current phono stages now take care of any impedance matching - either with a ‘continuous’ impedance dial or via switches. If you’ve ever had the time or inclination to hang out on vinyl audiophile forums online, you may have encountered posts of people trying to build their own phono stage preamps. Sure, many designs are simple, if you have a knack for that kind of thing - plenty of schematics can be found online. You can now easily buy any boutique component - from op amps and precious metal film caps to complete DIY preamp kits. 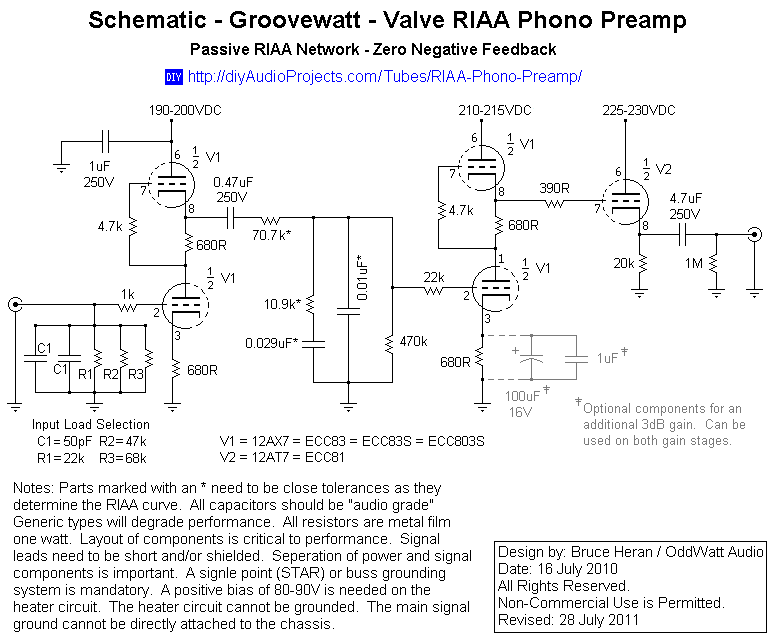 Perhaps the best way to understand what makes phono preamps tick is looking into some of the original designs dating many decades back - like the RIAA Stereo Compensated schematic, since its circuitry is still considered a timeless classic. Let’s start with that word - compensated, as it really hits the bullseye from a design perspective and also in explaining why we need phono preamps in the first place. When manufacturing a record, grooves are cut into the vinyl, and the cut of different frequencies varies in width - high frequencies have narrower width than bass frequencies. Historically speaking, this presented an unexpected manufacturing problem, since the narrower grooves of treble frequencies were getting ‘lost’ in the record’s noise floor. To counter this effect manufacturers (well, mastering engineers, actually) had to artificially boost the highs in order to literally enlarge their grooves and lift those high registers above the noise threshold. This is how the primary purpose of the phono-preamp (other than boosting gain) came about - to compensate for, or to tame, plainly speaking, the boosted tops (as well as sub-bass rumble frequencies) and bring them down to normal levels. The main circuit components achieving this filtering effect are called resistors. They act very much like sentries, only letting certain frequencies through. The cartridge signal passes through a 47K resistor, combined with a 100pF capacitor - these form the correct impedance of the cart while filtering out the nasty shrill boosted top end content above 30 kHz. On the other hand, the classic RIAA way of dealing with subby rumble is employing a 470Ω resistor with a 47uF capacitor. This is a simplified explainer on how a frequency response of a phono preamp circuit is built and needless to say, components with the same readings can come in a huge variety of quality as well as cost. Manufacturers of high-end phono stage preamps rely exclusively on their custom-made or boutique-grade component parts - the stuff that delivers the sweeter treble, cleaner bass and lower noise floor. The above explainer on circuit components hopefully lifts the lid on the subject of why vinyl records and cartridges from different eras of vinyl manufacturing may require a specific frequency response curve to portray the correct nuance and detail of the release. Many of the phono stage preamps on this list deploy one of several built-in switchable ‘classic equalization’ modes - just like the RIAA example mentioned, but let us immediately note that their function is quite unlike regular EQs, as found in A/V receivers and/or integrated hi-fi preamps. In a sense, these modes are very subtle - the passive circuitry simply ‘corrects’ the cartridge signal’s frequency response (and to an extent its signal-to-noise ratio) to match and mimic that of certain LP releases and specific decades from the historic vinyl manufacturing. Think of them as a filter that mimics the sound of a certain era. There are several universally recognized signature EQ curves - those associated with Decca, RIAA, Columbia, eRIAA, IEC, and eRIAA/IEC. If you happen to be using a cartridge with a vintage Decca spec (output, capacitance, impedance), just flip the switch/dial on your phono preamp accordingly - this will be as close as it gets to hearing the music ‘as it was intended’, certainly giving that old spinner an unexpected ‘remastered’ vibe. We already mentioned the intricate relationship between a record cartridge and the phono preamp. It’s a bit like how in the Batman movies a super small bat symbol (in this case the low level cartridge signal) is magnified by a huge spotlight (the preamp) resulting in Batman’s logo looming over the whole of Gotham city (alright, the metaphor here has to be a superhero-grade vinyl playback level). Indeed it’s all about optimum signal levels - starting at the source and moving along through every part of the signal chain. How phono preamps manage sufficient gain figures, especially for LOMC (low output moving coil) carts is achieved in different ways and that depends on several factors. Firstly, it matters whether the circuit is solid state or vacuum tube - SS designs are considered easier to achieve high gain and low noise performance than tubes as a rule. Solid state phono stage designs rely on the op amp circuits (operational amplifiers) and resistors used. Just like DAC hardware chipsets are crucial for digital audio, op amps are important for the gain capacity and the overall musical character of a phono stage. In regards to tube circuits, yes, they can sound glorious but gain optimization in such circuits often require additional gain boosters such as transformers. They work great with MM cartridges, but not having enough gain, they may require a sidekick to help them manage those difficult low output MC cart signals. Capacitance is a term describing and measuring electromagnetic signal behaviour characteristics like load and resistance, which occur as the signal travels through cable wire, switches and so on. It is measured in picofarads (pF) and…OK, let’s stop right here with the lab jargon and explain why is this so important for cartridges (MC in particular) and phono preamps. You will have seen by now that when talking of phono stage specs, we mention their ability (or not) to adjust capacitance values, in addition to signal impedance and gain (and all of that when going from the cartridge into the phono preamp). This feature (capacitance adjustment) is most needed with MC cartridges, which produce very low output signals. To deliver the correct frequencies to the phono stage preamp, different MC cartridges have specifically recommended pF values that the preamp needs to match. This is where we need to note that poor quality (or simply too long) phono cables running between the record player and the phono preamp (as well as pots, switches, and so on) that the signal happens to pass through can increase the pF value of a MC cartridge.This increased pF value (or excessive capacitance) affects the cartridge's inductance. Even if we’re starting to get big jargon-y again, what you need to know is that this is something you can hear. Excessive capacitance makes an audible difference. Simply put, in such instances the sonic character of the record player changes because Incorrect loads act as unwanted filters or equalizers, introducing resonant peaks (a bit like those heard when scrolling through stations on an old fashioned AM radio) and these can ‘rob’ your audio of serious amounts of frequencies - mostly slashing the bell-like clear top end, and making the material sound ‘muffled’, ‘honky’ or ‘hollow’. The general rule is that high capacitance values reaching the inputs of phono stage preamps result in a darker and duller audio signature. Lower values (than recommended for the cartridge) would result in an overly-bright and distorted signal. The ability to adjust the pF value directly from the phono preamp effectively cures the problem. An example of the process of fine-tuning the cartridge vs preamp capacitance would again start with taking the cartridge’s pF value. Look, stick with us on this. It’s complex, but it’s important, and we think the following example should clear things up. For instance, a contemporary star performer like the Soundsmith Zephyr cartridge has something like 100 - 200 pF value. A dedicated vinyl enthusiast would also have to take the capacitance specs of their tone arm (and its internal signal cable) - a worthy model such as the SME 309 Tonearm has capacitance values of 15.0 pF per channel. The sum of all of these pF figures needs to be matched at the preamp’s input capacitance settings (where available of course). One of this article’s top picks - the Pro-Ject Phono Box RS preamp - has several switchable settings - 100, 200, 300, 420, or 520 pF and assuming that the cart+tonearm+earth wire (and the thumb screw of the latter - yep every little thing ups the pF values) come to around 200 pF total. This should be the starting point for setting the Pro-Ject. One might have to flip between that and, say, 300 pF or even 420 pF (in case of a longer wire), and the sonic difference would in most cases be quite noticeable - again, mainly in the resonant character of the high frequencies. The most natural-sounding setting wins! What it comes down to is this: yes, there are some numbers involved, but don’t freak out. A little experimentation, and you’ll have this down pat. However ‘audiophile’ the circuit components may be, the phono preamplifier won’t do its job unless it has a top-notch power supply. Besides powering the system, there is a secondary role assigned to the PSU unit of a phono stage - one of a hum-destroyer. The noise picked up when amplifying such quiet signals as a cartridge feed is referred to as ‘mains pollution’. This percolates through the circuit, limiting the sonic benefits of high-end components. To minimize these mains pollution effects, manufacturers opt for high quality DC to DC converter chips, external high-voltage PSUs (Power Supply Units) which minimize interference and guarantee plenty of signal headroom. Vinyl connoisseurs can and do spend fortunes on power supplies and it doesn’t stop there - specialized power cables are also an important sonic factor as they affect the frequency response of the cartridge. Battery powered phono stages such as the Musical Surroundings Nova II are also popular with purists, as they solve mains pollution problems by completely removing mains-powered PSUs from their circuit. Balanced and unbalanced connections are often referred to as pro and semi-pro respectively, and can at times have a dramatic effect to audio performance. Generally speaking, balanced connections on phono preamps are rare and are normally found in the high end market examples (mostly as a three-pin XLR outputs). Are they important? Very much so. To avoid another massive tech jargon tangent let’s just say that balanced outputs offer an impedance balancing between the individual wires within the connected signal cable, resulting in a better transference of the audio signal - better in terms of signal to noise ratio. Balanced circuits may be indicated by a sign: +4dB, unbalanced ones, by: -10dB. In the real world, spaces with lots of wiring and/or light dimmers (commercial buildings, offices and the like) are notorious for causing ground loops and hums to audio equipment. These are the cases where balanced outputs can come handy and act as effective hum-destroyers.